If you have found a baby bird or mammal, or see an injured animal, it is human nature to want to help. But before you do, check to see if intervening with nature is really the right thing to do. The vast majority of the time the animals do not need our help. In the case of babies, more often than not, there are one or more parents nearby, but staying out of sight. Baby birds often leave the nests before they can fly, but will spend days hopping around and finding cover in bushes. Mom and dad will find them and care for them. 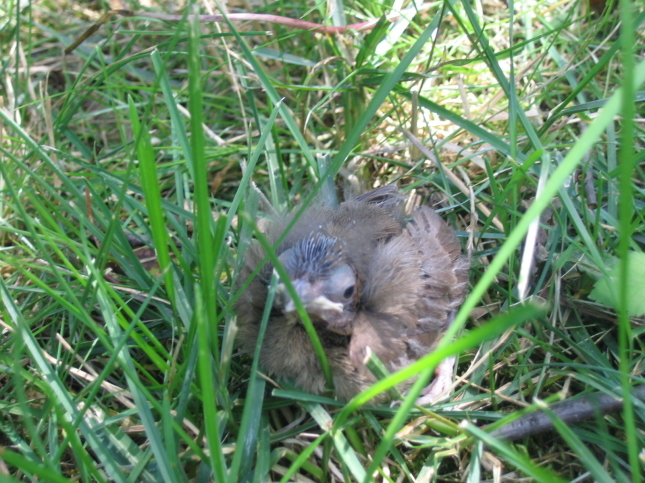 Featherless babies who have fallen from their nests can be placed back in the nests. (It's an old wives tale that birds or mammals will abandon their young if you touch them.) The best help you can give is to keep kids and pets away so the parents can do their jobs. Because baby birds are such easy targets for cats, please help us spread the word about keeping kitties indoors during the nesting season. At Wild Birds Unlimited, we are experts are helping you attract birds to your backyard, but we recommend leaving the rescue and rehabilitation of birds and animals to the specialists who are licensed to do so. Below are several Illinois wildlife rescue organizations you may want to contact for more information. Before you call, check out their websites for excellent information about when you should or should not try to help. *NOTE - Spring and summer are extremely busy seasons for wildlife rehabilitators and most run on limited staff, resources, and volunteers. As they may be busy helping the animals in their care, do not be surprised if you have to leave a message and have someone get back to you. Provides sick, injured and orphaned wildlife with rescue, rehabilitation, and re-release services. They also operate a 24 hour hotline to provide the public with 24 hour easy access to wildlife information and resources. Wild Bird Rehabilitation is the only organization in the St. Louis area that cares for native wild songbirds (like a Cardinals, Bluebirds, or Bluejays). TreeHouse Wildlife Center is dedicated to the rescue, rehabilitation, and release of native wildlife. The World Bird Sanctuary’s Kathryn G. Favre Wildlife Hospital admits 300-400 birds per year. They are unable to do pick-ups or rescues due to staffing. We are open to accept birds from 8am to 5pm every day except Thanksgiving and Christmas Days. They accept all birds of prey (hawks, owls, eagles, vultures, falcons etc.) as well as herons, pelicans and swans. The Wildlife Rescue Center rehabilitates injured, sick and orphaned native wildlife and releases healthy animals to their natural habitat.